Prepare this recipe by preheating the oven to 350 degrees. Top the raw chicken breast with pepper, garlic powder, and onion powder. Put chicken breast in a shallow baking dish, cover, bake for 30 minutes or until the juices of the chicken run clear (20 minutes with lid, 10 minutes without lid). 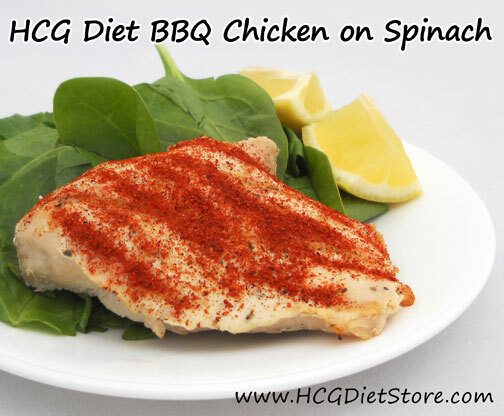 Remove from baking dish and sprinkle the cooked chicken with the Simple Girl BBQ Seasoning. Serve with spinach and lemon wedges. This recipe is allowed on the VLCD phase of the diet (also known as Phase 2 or the 500 calorie phase). This recipe equals 1 serving of vegetables, 1 serving of meat, and part of your daily allowed juice squeezed from a lemon.